Quite often on many lists we will hear the term Best Current Practice (BCP) 38 bandied about and further recommendations to implement   (See NANOG Mailing list archive) . Some will say ‘it will aid in DDoS mitigation’ and even others will even state ‘All Internet Service Providers (ISP) should implement this." Now before the philosophical discussions ensue in the comments, it might be a good idea to discuss, technically, what it is? And perhaps what it can do? Let us know if you are using or have implemented BCP38? We recommend it and do feel that it has technical merit and can help reduce risk! Members of NANOG are putting some efforts to make BCP38 information more available to a wider audience, in the hope that it could create some customers pressure to start cleaning up that mess. PS: Let moderator "hat" bcp38.info know if they can incorporate the graphic in that wiki. Posted on NANOG for off-list contact. Permission definitely granted! Just out of curiosity, how come you reference RFC2267 as the definition of BCP38, when RFC2827 is the official definition of BCP38? They're almost identical in terms of content, but RFC2827 states in its header that it both obsoletes 2267 and defines BCP38. 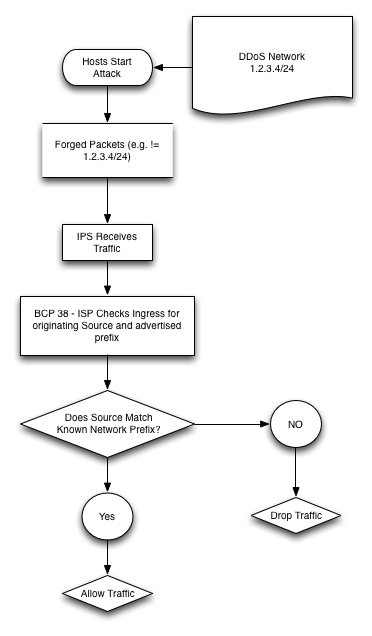 Looking into deploy BCP38 on a customer facing interface. I came across some suggestion about deploying something like this.Looking for any input from you guys.